Enjoy this short video guide to help you navigate your way to Weissman's Midtown office. Walk east to the corner of 10th & Peachtree Street. 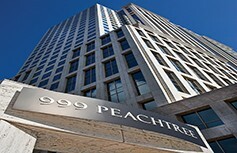 999 Peachtree is located across the street from the Margaret Mitchell house. Take 400 SB until it merges onto I-85 SB. Follow I-85 Southbound directions below. Take Exit 84 for 17 ST/ 14 ST/ 10 ST. Follow the 17th Street signs. Take a right onto Spring Street. Take a left onto 10th Street. Cross Peachtree Street, and then take a right, into the Hyatt Atlanta Midtown entrance driveway. Take Exit 250 for 16 ST/14 ST/ 10 ST.
Stay left and merge on to the 14 ST/10 ST ramp. Continue straight until the second light and turn left onto 10th Street. Turn right into the Hyatt Atlanta Midtown entrance driveway. Take I-75/85 northbound toward Atlanta. Take Exit 250 for 10 ST / 14 ST. Turn right onto 10th Street (going east). Go three traffic lights on 10th Street to Peachtree Street. Take a right, into the Hyatt Atlanta Midtown entrance driveway. The 999 Building and Hyatt Atlanta Midtown share the same parking deck. Visitor Parking is available on Level 2 and Level 3. Please pull a ticket and Weissman will validate your parking. You are on level 3 when you enter the parking deck. Take the parking deck elevator to the P (Plaza) level and walk through the covered breezeway to the 999 Building entrance. The elevators to the left of the reception desk will take you to the 5th floor, Suite 525. Welcome to Weissman’s Midtown office. Click below to enjoy an interactive virtual tour of the office located in the heart of Midtown.